One year after Tunisia's Ben 'Ali is ousted, the face of the Arab world is forever changed. With the remarkable winds of change sweeping down the region, the middle East is perhaps forever changed. No longer are its populations fearful of despotic states. More importantly, the orientalist arguments for a democratically-challenged and freedom-resisting Middle East are shattered. This past year has forced us all to face down the realities of a new Middle East, brimming with youth, disenchanted, beset by grim prospects, but nonetheless eager to revolt in refusal of what their fathers and forefathers quiescently lived under for decades. The collapse of Ben 'Ali's dictatorship led to the increased vulnerability of the edifice of the Arab authoritarian state and created momentum for the other protest movements in the region. Despots have fallen in Egypt, Libya, and tremendous challenges for survival are facing those in Syria, Yemen. All the while monarchies in Morocco and Jordan have undergone sheepish constitutional and governmental reforms. Tunisia, the cradle of the so-called Arab spring, is leading the torch so far by slowly building the foundations for democratic transition. Despite concerns of Islamist authoritarian tendencies by al-Nahda, I remain optimistic. Ideological divides are bound to occur in post-authoritarian regimes; however, these become detrimental when they are institutionally grounded and become hurdles in the way of socio-economic development. Many have addressed the secular-Islamist tension in the Tunisian society especially after the events in Manouba University where Salafists closed down the Humanities College to protest over the issue of niqab (integral veil). The Islamists have not helped their cause either as they engaged in several foolhardy actions that have not generated any good will. PM Hamadi Jebali (secretary General of al-Nahda) took advantage of his appointment powers to bestow key ministerial portfolios upon close al-Nahda associates. However, it was his unilateral appointment of new directors for state media that drew most of the criticism, especially as many of the appointees are relics from the ancien regime. Finally, the recent visit of Qatar's Emir Hamad has further divided the country. On the regional level, al-Nahda's courtship of HAMAS has drawn consternation from those that seek to cast a non-radical image of Islamists in power. This could prove to be a perilous relationship. Such association could also jeopardize Tunisia's prospects for foreign investments and capital. Unemployment rates are high and expected to be higher by the end of the year averaging %19-20. This is indeed the most pressing challenge for the current government that has to generate enough opportunities for foreign investment to boost a stagnant economy, spur productivity and lower the unemployment rate. Years of myopic economic plans and kleptocratic practices have resulted in uneven regional development between the affluent north and the marginal south of Tunisia. One year after the collapse of Ben 'Ali, Tunisia is firmly in charge of its own destiny, but much of the future trajectory of the country will depend on the ability of the current leadership to shun ideological differences in favor of more pragmatic solutions for socio-economic development. The most excellent way to sidestep the secular-Islamist divide is to deliver in the process of governance and relegate much of the religious matters to the realm of individual privacy. The goal hopefully is to establish a civil state that recognizes the religious and ideological diversity of its own citizens. One year ago, the singular desperate act of Mohamed Boua'zizi had tremendous reverberations throughout the world, not just the Arab world. Arabs taught every society democratic or none, that change is in the hands of those that protest actions of misguided or autocratic governments. 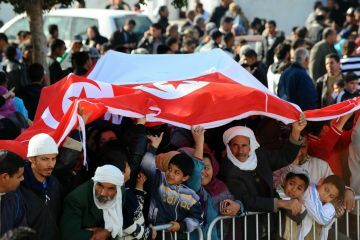 Tunisia has since toppled its dictator and produced well-run free elections that resulted in the popular election of the Islamists of al-Nahda. The movement of Rachid Ghannouchi has initially shown great readiness to build compromises with different ideological positions in the Tunisian political landscape. It will be a misfortune for Tunisia if the movement abandons its conciliatory position and adopts some of the old regime's style of governance.